The Saltwater Celtic Music Festival has set its sights high: to design and present one of the premier Celtic music festivals in North America. 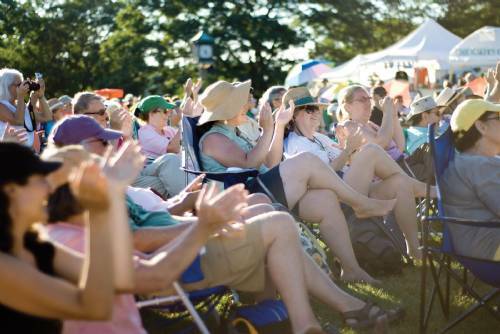 The famed festival is finally back in town and will occur on Saturday and Sunday, July 14-15, 2012 at Thomas Point Beach in Brunswick, Maine. Gates open at 1:00 p.m. on Saturday and 11:00 a.m. on Sunday for the approximate six hour show each day. Saltwater is a rain or shine event and tickets are non-returnable/non-refundable. Admission for one day is $35 while a ticket for the two day event is just $60. Children under 12 who are accompanied by an adult are admitted free of charge. Saltwater Satellite Events will occur throughout Maine during the week leading up to Saltwater. Saltwater tickets are available online (www.saltwaterfest.com) for pick-up at will-call. Byrnes Irish Pubs in Bath and Brunswick will be presenting a full slate of Saltwater Satellite Events before, during and after Saltwater, the evenings of July 13 through 15 for free. During the festival, performances will begin at 2pm on Saturday and continue until 7:30pm with such great bands as The Press Gang, Chrissy Crowley, Sprag Session, Searson, Carbon Leaf and Enter The Haggis. Maeve Gilchrist will serve as the emcee on Saturday. On Sunday, beginning at 12pm and continuing until 5:30pm, The Maine Celtic Scene, Maeve Gilchrist, The Makem and Spain Brothers, The Screaming Orphans and Black 47 will perform with noted author and recipient of the 2012 JFK National Award, Kevin O’Hara, as the emcee. Luckily for the audience, these artists and many more will be available for a meet and greet following their performance. The highly popular Celtic Merchant Mart and Frost Gully Violins Session Tent will return as well as The Saltwater Pub Tent, which will be open for business during festival hours and serving Griity’s, Murphy’s and Honeymaker Mead to those over 21 years old. Just like last year, numerous and tasty food and beverage vendors will be serving throughout the weekend at lovely Thomas Point Beach. This venue offers camping, a beautiful playground for children and a sand beach. New this year at the Saltwater Celtic Music Festival are workshops on Gaelic song and various Celtic dance traditions, The Saltwater Art Tent (hosted by Artist In Residence, noted hay sculptor and USM professor, Michael Shaughnessy), The Saltwater Lit Tent (co-hosted by Writer in Residence Jana Laiz and emcee Kevin O'Hara), 19 Saltwater Satellite Events involving 18 venues and Saltwater’s Books and Pubs Tour featuring signings/readings in a great Maine bookshop followed by a social hour in a great Maine pub. Make sure you bring a lawn chair or blanket so you can sit in the perfect spot to see all the shows. Remember that Saltwater is a rain or shine event with limited coverage in the event of bad weather so bring an umbrella just in case. Please leave any coolers, glass, pets, alcohol, drugs, firearms, fireworks, skateboards, roller skates, scooters and beach umbrellas at home. Saltwater will provide everything you need in order to have a safe and fun day. The Saltwater Celtic Music Festival is proud to have sponsor relationships with leading brands and organizations, including the Maine Irish Heritage Center, Comfort Inn of Brunswick, 98.9 WCLZ, Cool As A Moose, Gritty McDuff's, Murphy’s Brewery, Maine Mead Works, Green Bee Soda, MPBN, Maine Magazine, The Times Record, The Forecaster, and Riley insurance.